Schultz isn't wasting any time showing people why there was such a publicized bidding process before the Edmonton Oilers secured his rights this summer. The 22-year-old free agent defenseman from the University of Wisconsin had two goals, an assist and was on the ice for all five of Oklahoma City's goals in a 5-1 victory. He's playing with a few established NHL young stars, but Schultz has a team-leading four goals and six points in four games for the Barons to start the season. Caron looked like a first-round pick from the 2009 NHL Draft on Friday night, scoring a hat trick in the Bruins' 4-3 victory. They were his first three goals of the season, but he is one of several Boston prospects that figure prominently in Providence's forward corps. Ryan Spooner had the other goal, and the 2010 second-round pick is tied for the team lead with four points with Boston's second-round selection from 2008, Maxime Sauve. Ekman-Larsson played 15 AHL games in 2010-11, but he has as many goals in three contests this season. He had two tallies and an assist to help the Pirates collect a wild 7-4 win against Worcester. The future offensive potential for the Phoenix Coyotes' blue line was on display in this contest -- fellow 21-year-old David Rundblad had two assists and Maxim Goncharov, 23, added a pair of assists as well. Ekman-Larsson has three goals and five points in three games for Portland. Other notes: Jake Allen stopped 28 of 29 shots to help Peoria defeat Rockford. Allen is St. Louis' undisputed top goalie prospect with Ben Bishop in Ottawa's organization. … Speaking of top goalie prospects, Hershey's Braden Holtby didn't play this weekend after he was scratched Friday from a scheduled start with an undisclosed injury. … Cam Atkinson and Ryan Johansen, Columbus' top two young forwards, had a goal and an assist each to help Springfield beat Wilkes-Barre/Scranton. Joe Morrow, Pittsburgh's first-round pick in 2011, had his first professional goal in the contest. … Zach Phillips, also part of the first-round class of 2011, also potted his first as a pro in Houston's 5-1 win against Texas. Fellow top Minnesota prospects Charlie Coyle and Jason Zucker also scored for the Aeros. Granlund may be the top prospect in the AHL with zero NHL experience, and he's one of the top prospects in the sport. He had four goals in an exhibition game earlier this month, but he had his first "wow" effort in a regular-season contest in another Aeros' win against Texas. The 20-year-old had his first two AHL goals and added two assists, and he leads all AHL rookies with seven points in five games. Foligno finished with a flourish last season, and he's still in form in the early stages of this campaign. He had two goals and two assists to help Rochester in an 8-7 win against Hershey. Foligno had six goals and 13 points in 14 games for Buffalo after being recalled late in the season and nearly helped the Sabres to a playoff berth. 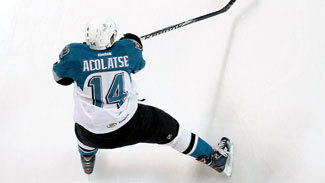 He's tied for the AHL lead with five goals and he's second with eight points in five games. Panik had a goal and two assists as the Crunch rallied from a five-goal deficit to win 6-5 in overtime. His goal was the winner at 3:44 of the extra session, and he helped set up the final two goals in the third period. A second-round pick in 2009 by Tampa Bay, Panik was one of four players under the age of 22 in Norfolk's top five scorers last season. Other notes: Jeremy Smith was a second-round pick back in 2007 by Nashville, and while the Predators have had other young goaltenders emerge, he had a strong 2011-12 for Milwaukee and stopped 18 of 19 shots in 1-0 loss Saturday to San Antonio. … Montreal prospect Louis Leblanc had two goals Friday for Hamilton, but the next night he left the Bulldogs' contest with a right leg injury. An update on his status is reportedly forthcoming this week. … Jacob Josefson had two goals, Adam Larsson two assists and Keith Kincaid made 30 saves to help the Albany Devils defeat Worcester 4-0. Nyquist scored a pair of goals sandwiched by one from fellow top Detroit prospect Tomas Tatar, and then had the clincher in the shootout as the Griffins defeated Toronto 4-3. After three standout seasons with the University of Maine, Nyquist had 58 points in 56 games for Grand Rapids last season and added seven in 18 contests for Detroit. The Monsters are rolling with a pair of AHL rookies in net, and early returns have been strong. Pickard stopped all 25 shots in a 4-0 win for Lake Erie against Texas. A second-round pick in 2010 by Colorado, Pickard has two shutouts in three starts. Fellow rookie Sami Aittokallio, a fourth-rounder for the Avalanche in 2010, has only allowed four goals in two starts as well. Hayes had the first two goals of his season in the third period of a 5-4 win for the IceHogs against Charlotte. He potted the go-ahead goal with 5:36 remaining and the eventual winner with 1:19 left. Hayes is part of a strong contingent of Rockford forwards who have NHL experience with the parent club in Chicago. Other notes: Charlotte defenseman Justin Faulk left a game Friday and missed Saturday with a reported muscle strain, but he returned Sunday and had two assists. … The injury to Holtby meant a call-up from the ECHL for Philipp Grubauer, and he made his AHL debut. A fourth-round pick by Washington in 2010 (same round as Holtby two years prior), Grubauer made his first impression a strong one with 24 saves in a 2-1 overtime loss to Binghamton. … The Norfolk Admirals went on one of the most impressive runs in the history of the sport last season, including a professional hockey-record 29 consecutive wins en route to the Calder Cup. 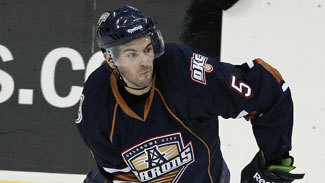 Those players are in Syracuse this season after an affiliation shift, and the Tampa Bay properties are still rolling. They won Sunday at Wilkes-Barre Scranton to improve to 4-0-0-1 and lead the AHL with nine points. Interestingly, the guys who replaced them in Norfolk (Anaheim's new affiliation) are off to a 4-0-0 start and are in second place in Syracuse's division.